Welcome back, friends! This is the week! We are moving this Saturday! We’ll be in our very own house with our very own cats and our very own yard and our very own fire place! It’s going to be awesome! But first, the packing must be done and so, this week is probably going to be all about the packing process. I hope you’re ready! So I’m sitting in my comfy chair next to an ever growing pile of boxes. We thought it would be a good idea to pile the boxes up at the far end of the living room as they’re packed to get them out of the way and clear space for more packing. It’s kinda worked thus far. My mom came up last Tuesday to help me pack the living room stuff, which was super helpful. One thing I know all too well about myself is I need someone to keep me on task with things like this. I’m so bad at doing them by myself. But, having mom here was great. We packed and we chatted and things got wrapped properly so they won’t break in transit and I can’t remember if I put “fragile” on the box of picture frames. I feel like it’s kind of implied with “picture frames” but you never know. I mean, I’m pretty sure they’re safely packed, but I might want to go back and check. My walls look so empty right now. I do still have to take the Christmas cards down, but the wall behind our TV has never been blank. The Scavo sign used to live above it and that was the very first thing we put up. Now it’s sitting wrapped in bubble wrap waiting for some one to gently take it over to the new place, since it won’t fit in a box. Our DVD shelf is empty, under the TV is empty. I packed up all the console game stuff, controllers and all. I should have left the WiiU out, but I didn’t want to be doing things in pieces. So we’ve been playing games in the computer room instead. Today I’m going to listen to Ray Bradbury’s Something Wicked This Way Comes and pack up knick knacks and maybe under the bathroom, and try to tackle the bedroom. The bedroom is the scary part, I think. I mean, What do I do about all the clothes I need to wear this week? What is safe to pack, and how? Our friends used trash bags for their clothes, but I don’t know how I feel about that. They also used their luggage, which is a good idea, but we don’t actually really have real luggage. Just two small suit cases and a duffle bag. So, you know, not a lot of room for stuff. I’ve got a couple random bags that I can shove things like sheets and stuff into, so that’s cool. The other thing is,the closets.The hall closet is full of things in boxes already. Things that come in boxes that we never got to pull out because we didn’t have the space. Did you know we had a cappuccino maker? We do! It’s in our closet, waiting to be moved. And a bread maker that I’ve always wanted to use, but never had the space for. And two ice cream makers, actually, though one didn’t come in a box. And a deep fryer that we never use. There’s so much stuff in the closet. I’m debating on if I should drag out the boxes that are in the closets now or wait until Saturday, or maybe Friday. They’ll just be in the way, really, but I think seeing empty closets might be good for us. Ah well. The back room is similar. 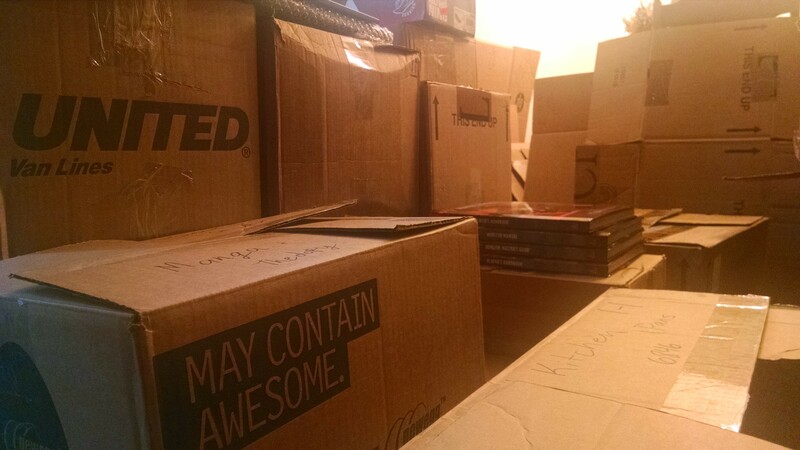 Many boxes that were just never unpacked. There are several from my college apartment that just bounced around without being opened. That’s the way moving goes, I guess. I’m looking forward to having a basement to store stuff in so we can get some of this stuff out of the way. I keep thinking about the new place and how much space we’re going to have and I really can’t wait! On a side note, Wednesday’s post may be a little late. We’re taking our poor kitties to get spayed in the morning and I’m not sure when I’ll get to writing. Maybe I’ll type something up the night before, we’ll see. Until then, have a lovely day, my friends.